Over 25 years experience of joinery gives us the skills and knowledge to provide a range of solutions to any joinery jobs you have. We offer our customers an unrivalled joinery service throughout Glasgow and the surrounding areas. All joinery work carried out to a guaranteed high level. We offer many different joinery services. For a full list of our skills on offer see below. Click here to view a slideshow of joinery work we have previously done, services and solutions offered. We can supply and fit any wood moulding. Door facings, skirting, dado – you name it we supply it. A new service offered which is becoming a big hit with our clients. If we do not have samples of what you require we’ll take an imprint of what you need – you won;t get this service from the big DIY stores. 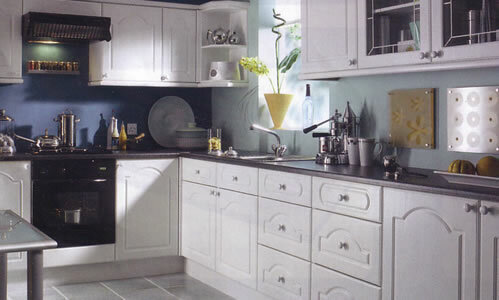 Handyman Services Glasgow can offer you full kitchen packages. We will supply and fit full kitchens including new white goods. Prices start from £2,500. See our joinery slideshow for the kitchen packages available. We can source and fit new kitchens so if you are moving house we can supply a budget kitchen to enhance your property for sale through to the high end kithcens from top suppliers such as Magnet and Howdens. Take the needless worry out of flat-pack assembly – let us do it for you. We have our own premises for this type of work. We will build the furniture and dispose of the packaging for you. New locks supplied and fitted, old locks replaced. All locks are insurance approved. We can also supply and fit security door bars. Various home security products can be supplied. We offer a Free Security Survey and advice given. Beat the Burglar! Many designs available for you to choose from. We’ll supply and fit porches for any style of house. The materials that we use are recognised in all the trades that we carry out.